Nine Inch Nails has suddenly come out of a five-year hiatus. Earlier this year it was announced that Nine Inch Nails would be reforming for a North American tour beginning in the fall. Now, the word has gotten out: not only will the band be touring, but they will also be coming out with another album. Trent Reznor, Nine Inch Nails frontrunner, admits that he’s been “less than honest about what I’ve really been up to lately.” He’s been working with producers Atticus Rose and Alan Moulder on the new album, titled Hesitation Marks, which is scheduled for release Sept. 3. Fans who preorder the album will be given a free download of the new single, Came Back Haunted, which leaked Wednesday night. Nine Inch Nails debuted in 1989 with their first album, Pretty Hate Machine. Trent Reznor has been the staple of the band since the beginning, along with a rotating cast of band members that changes with the direction of the band. 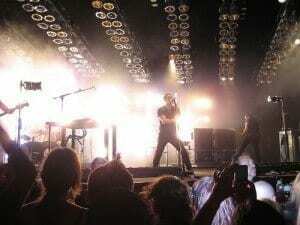 Since 1989, Nine Inch Nails has produced eight studio albums. The band has been nominated for 12 Grammy Awards, winning twice (once in 1992 for Best Metal Performance for the song Wish, and again in 1995 for Best Metal Performance for the song Happiness in Slavery). The new Nine Inch Nails will feature Trent Reznor along with Eric Avery of Jane’s Addiction, Adrian Belew of King Crimson, Josh Eustis of Telefon Tel Aviv, Alessandro Cortini, and Ilan Rubin. Nine Inch Nails also released details on their tour, Tension 2013. The tour will launch on Sept. 28 and run until Nov. 25. This is their first concert series since 2009’s Wave Goodbye Tour, and it is a continuation of 2008’s Lights in the Sky.